My wife makes a mean Welsh Rabbit. Stouffers Frozen Foods offers Welsh Rabbit, but they spell it Rarebit. What happened to the original part one for "Meet Me" posted before the "Taxi!" entry? Or as I liked to call it, "Sexual Perversity in St. Louis". What a fantastic post! 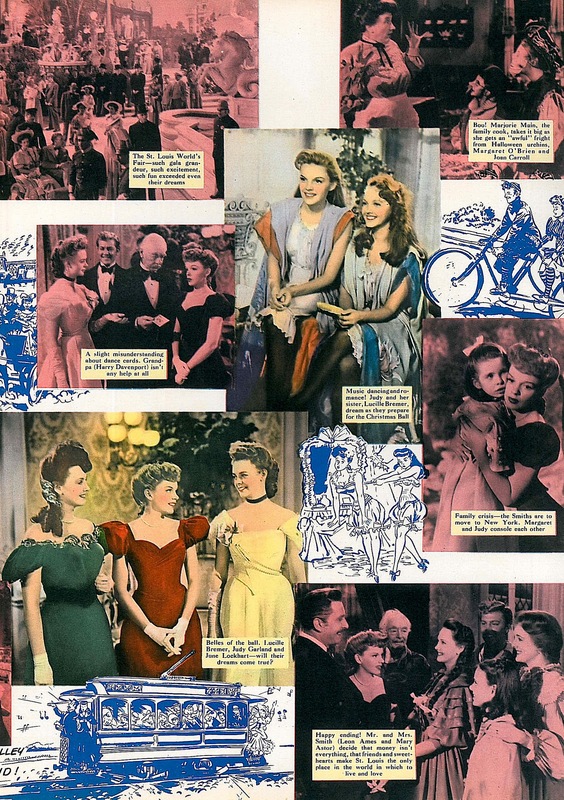 This is one of my three most favorite movies ever, along with SEVEN BRIDES FOR SEVEN BROTHERS and THE SOUND OF MUSIC. 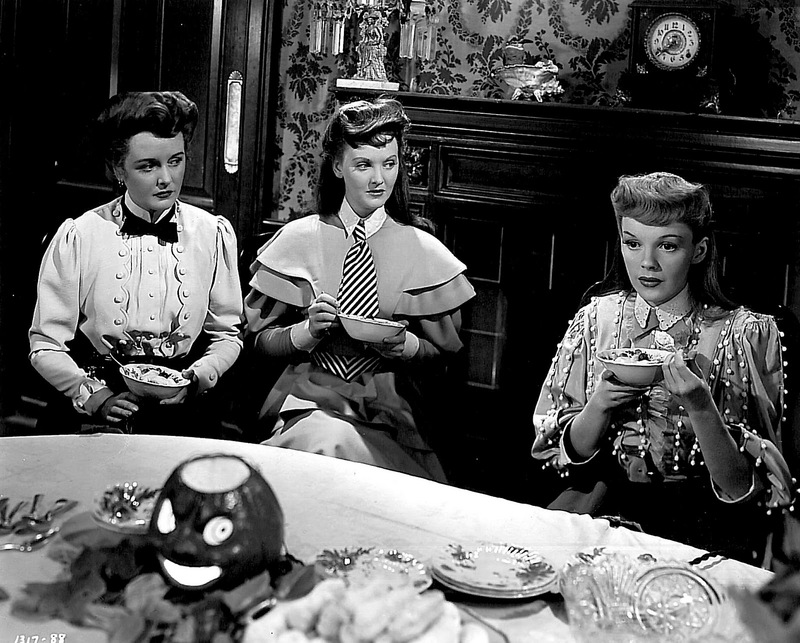 I've been collecting stills from it since I was 11 or 12, and happily I have the ones you show here, except for that terrific shot of Esther and Rose with the ice cream; I was always enchanted the ice cream came in little cartons that looked like they go with Chinese food. And I've never seen the bottom still you posted -- loved seeing it! And what a jolt to have you comment on the exact same chorus girl who's so intrigued me for years. 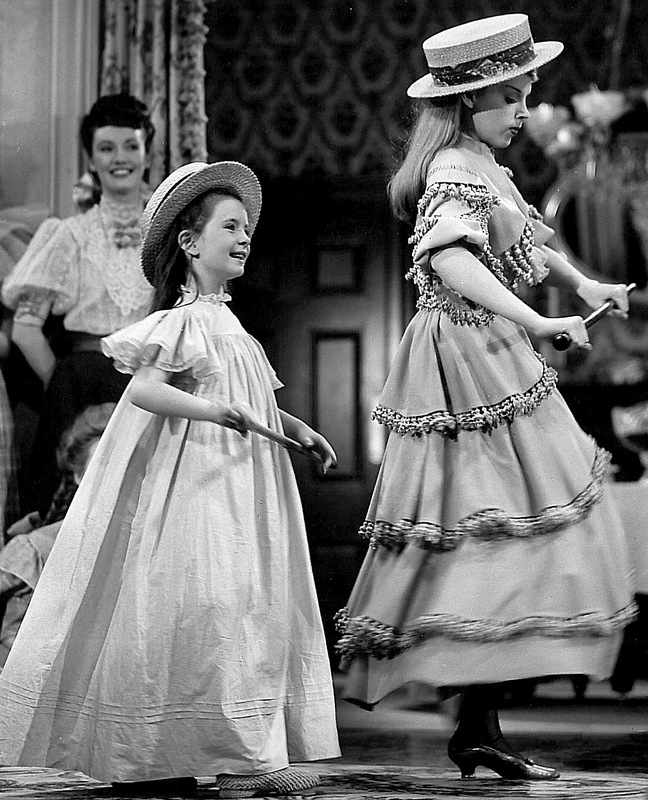 I watch for her in MGM musicals -- her dark hair and large mouth make her easy to pick out of a crowd -- and you can also spot her in YOLANDA AND THE THIEF, EASTER PARADE (during "Stepping Out With My Baby"), and THE PIRATE, among others. Thanks to a class my parents audited which was taught by Charles Walters circa the late '70s or early '80s, I also got to meet another of the chorus girls, who's in the Trolley Song -- I'm almost 100% positive her name was Dorothy Tuttle, and she was definitely a different chorus girl than the one you're trying to name. Both women were on the trolley. Dorothy was also a Harvey Girl. Like you, I've never been sure of the name of the dark-haired girl. I loved your comment "I've lived in this movie a long time." What a great way to put it. Looking forward to Part 2! John, I appreciate your kind words more than I can say. Your feedback is a great encouragement! Thanks very much for the link. I'm a relatively recent convert to this movie. For whatever reason, I hadn't watched it until a few years ago when I caught it on TCM. Now I watch it every time it's on, regardless of when I catch it. A perfect movie, and that includes its unsatisfying, stiff, and trite ending. Thank you, Hollywood! I love the fact that it shows at Christmas but includes one of the best Halloween sequences in any film. Also love the attention to detail throughout ... it truly "insists upon itself." Coppola couldn't have done better. I've seen footage of some alternate ending (?) with a ridiculous "cast-of-hundreds" torch procession, but I've never seen movie footage of the swamp sequence you refer to. Does it exist? Chris, the "torch procession" you refer to was a sequence deleted from THE HARVEY GIRLS, not MEET ME IN ST. LOUIS. Not as much as a single frame of deleted footage from ST. LOUIS has turned up in the MGM vaults, though Garland's truly lovely rendition of "Boys and Girls Like You and Me," a Rodgers and Hammerstein number excised from OKLAHOMA! and sung during the swamp sequence John refers to, is extant, both in its soundtrack rendition and a commercial recording she made for Decca. 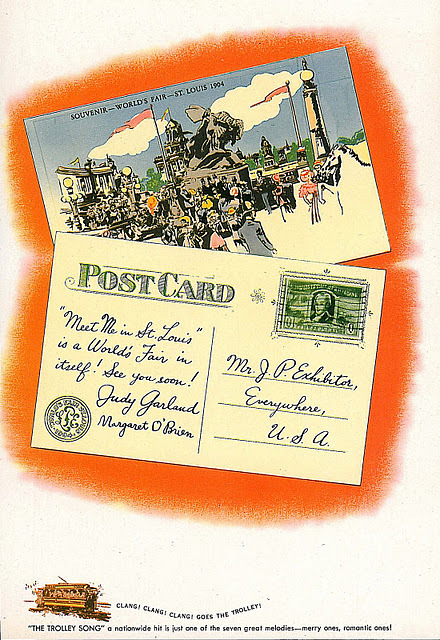 John, my experience with ST. LOUIS was much different than yours. I saw it around 1980 in a theatrical showing at the Arts Center in Little Rock, Arkansas, and it played to a sold-out house. I remember that very well because I was able to get in only through a friend at the Arts Center. 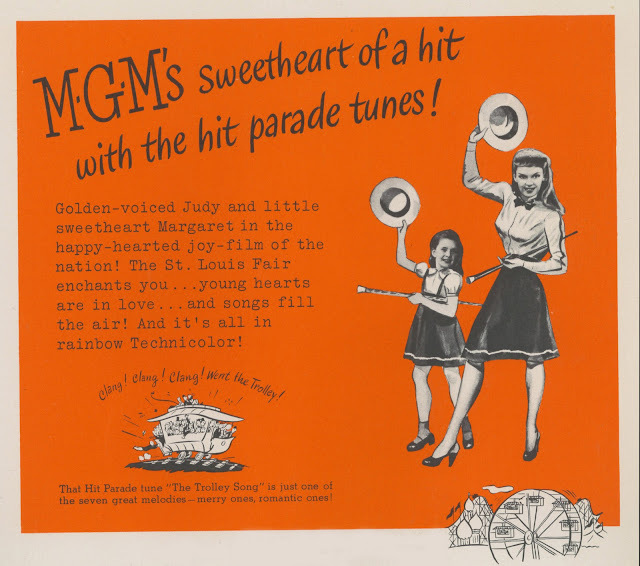 The CBS station there had the MGM pre-48s for years and years, but ST. LOUIS and HARVEY GIRLS were just about the only musicals out of that package they ever aired. 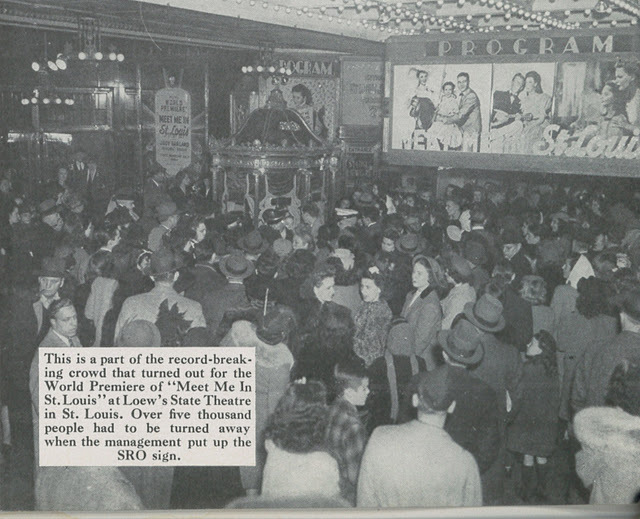 ST. LOUIS was brought out every year, generally just after Thanksgiving. Hey, man, aint you never ate a piece of cheese melted on a slice of bread? Out in the provinces we called them "cheese puffs". A great post about a beloved movie. ST. LOUIS is the only Garland film I can watch without her manic neediness giving me the willies. I received a somewhat violent musical education myself. My piano teacher smacked my fingers with a wooden ruler one time too many--right now she's probably twinkling the ivories on a showboat on the River Styx...Plink-plink-plink. 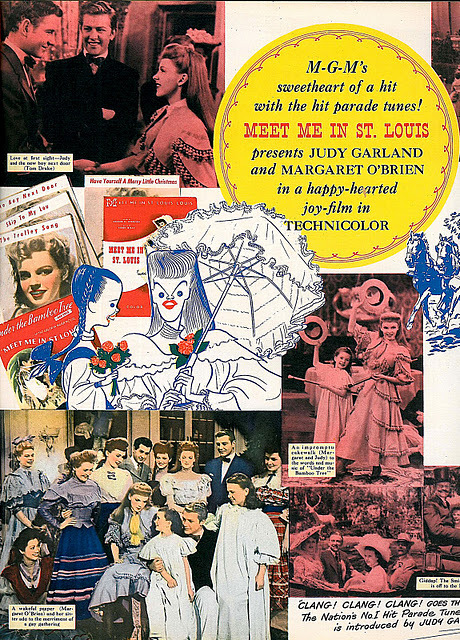 What a treat to read this column on the day my blu-ray of Meet Me In St. Louis arrived from Amazon.com...and that blu-ray disc makes it the 4th (or maybe the 5th) version of the film I have purchased due to changing technology. 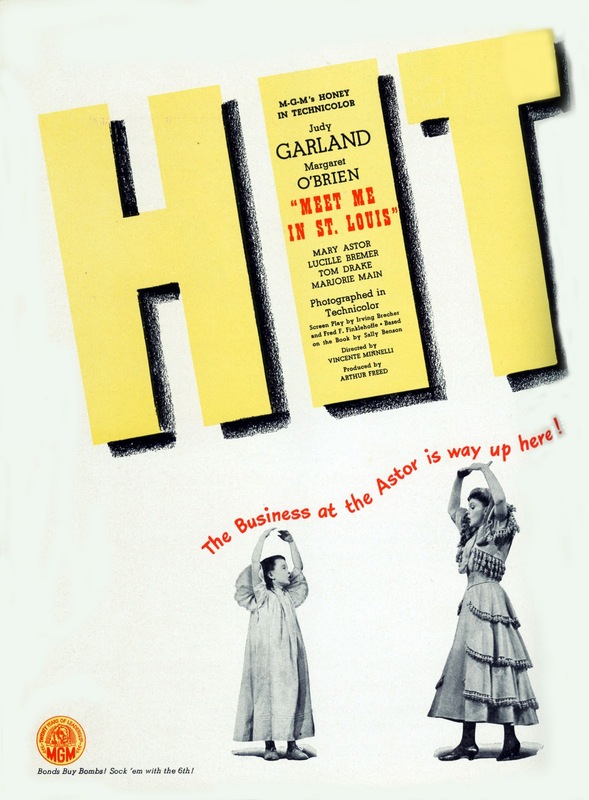 I love this film very much, Minnelli's artistry is all over every shot. The lighting of every shot, the very-specific set design, all reflect his creativity. 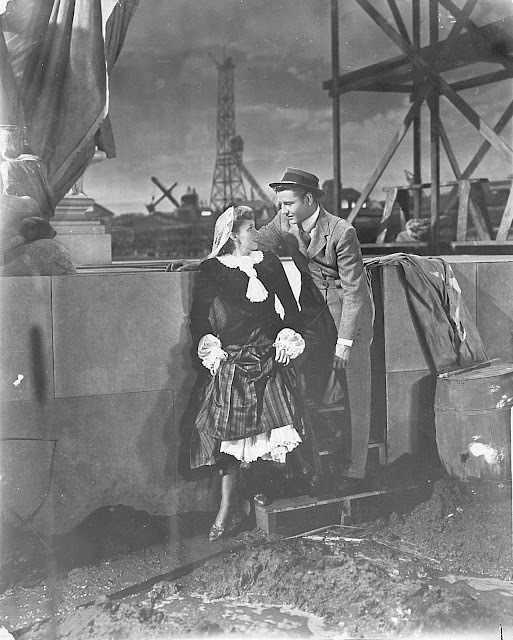 The scene of Judy Garland and Lucille Bremer singing together at the piano in a non-essential scene so closely mirrors a Renoir painting at the Metropolitan Museum of Art, I don't know, but I like to think it served as the shot's inspiration. 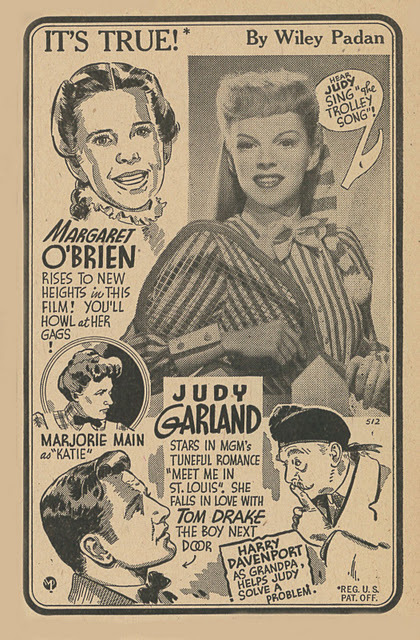 Judy Garland, IMO, was never photographed as beautifully as she was in this film. The way she looks when the curtain falls in front of her as she finishes singing about "The Boy Next Door" is breathtaking. The torchlight sequence discussed above is the "March On Little Doagies" outake from The Harvey Girls. 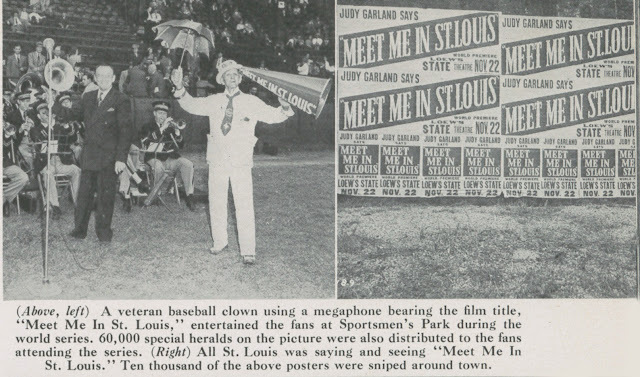 Though a few alternate shots ended-up in the trailer, unfortunately no cut footage from Meet Me In St. Louis is known to exist. 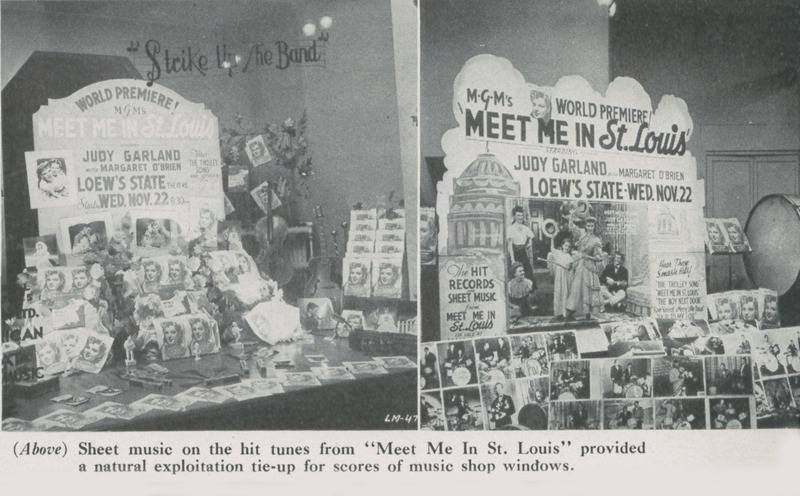 All that survives of the deleted "Boys And Girls like You and Me" number is Garland's pre-recording, a few stills, and in the sequence at the World's Fair, Tom Drake references the deleted scene via his flat reading of the line "I liked it better when it was a swamp and there was just the two of us." "Welsh Rarebit" figures prominently in a GOMER PYLE USMC TV episode- it makes him have nightmares! My introduction to MEET ME IN ST. LOUIS was seeing the entire Halloween sequence on some PBS show when I was about 12. (c.1972) It TERRIFIED ME! I had no idea what it was from (Maybe a Great Directors/Minnelli doc?) or what I was seeing... but it was so vivid (as it still is!) I felt like I was LIVING IT! Surely one of the most horrific childhood things ever put to film. 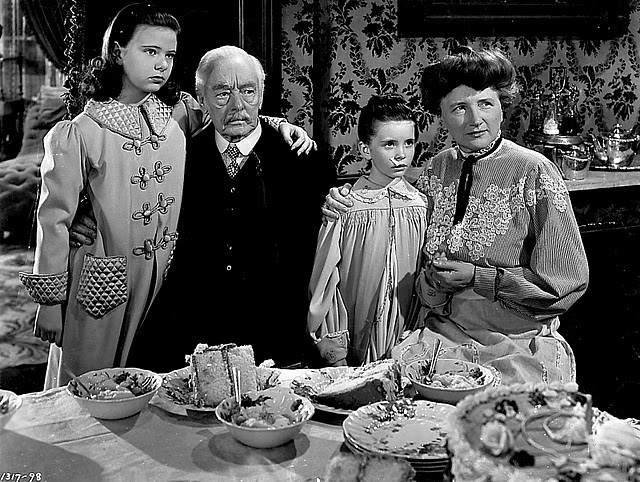 Seeing it later and now in context with the rest of the film... With the Christmas part... One of the greatest holiday films. Yes, an all-time favorite. You should give a special link for those interested in the "perversity" aspect you say of MEET ME! 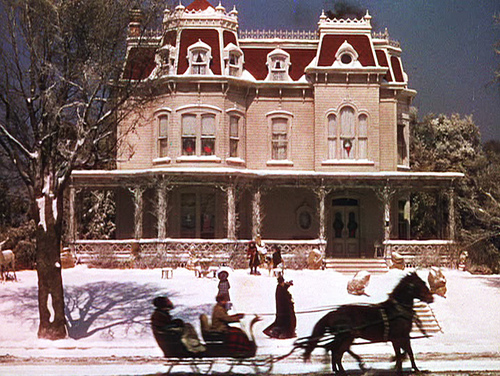 One wonders if Disneyland's Main Street -- and a lot of other period imagery -- is shaped more by this movie than reality. MMISL offers a persuasive utopia, dust-free clothing and all. It's interesting that the city itself is kept offscreen and big cities are regarded as heck-holes. Also, it abandons the rural small-town ideal that previously defined Good Old Days for mainstream studio escapism. MMISL trades the farms, barefoot kids and lazy creeks for a very prosperous neighborhood convenient to a metropolis, full of big houses and expansive crop-free yards. 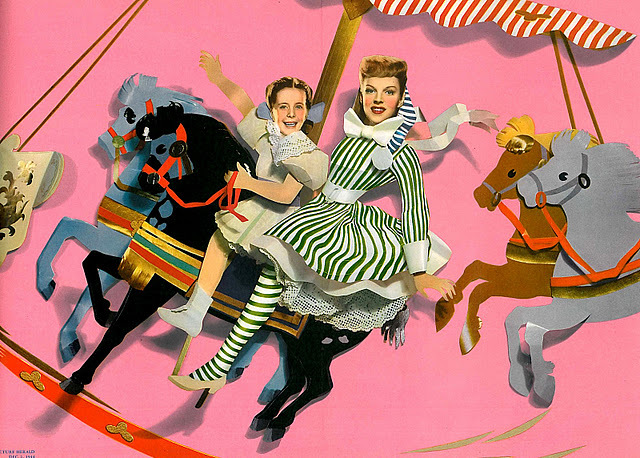 Later films like "The Music Man" and "Pollyanna," even though set in the country, upped their gingerbread architecture and period flourishes to MGM or Disneyland levels. Your mystery girl is Dorothy Gilmore Raye not Tuttle Nitch. 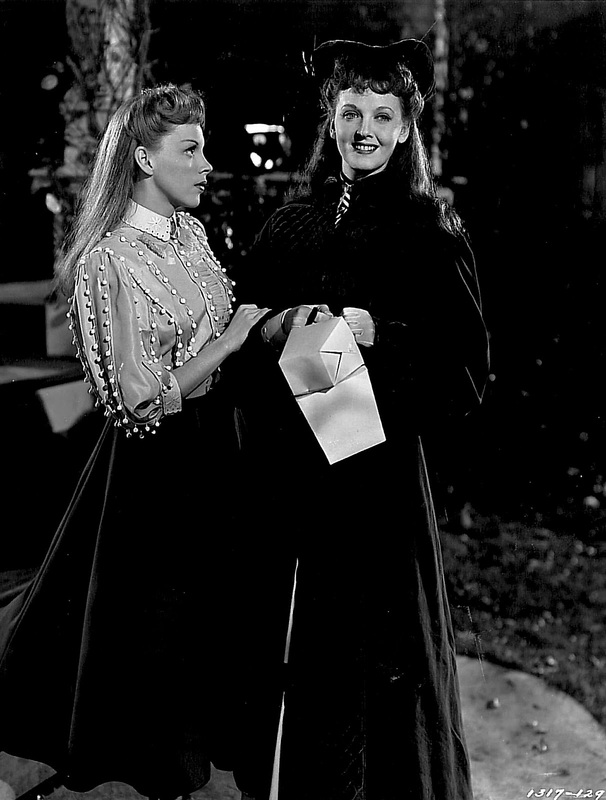 Both can be seen in a still from THE HARVEY GIRLS. Tuttle Nitch is in the center and Gilmore Raye is to her immediate right. Don`t resemble each other IMO. I made an error in my previous post. 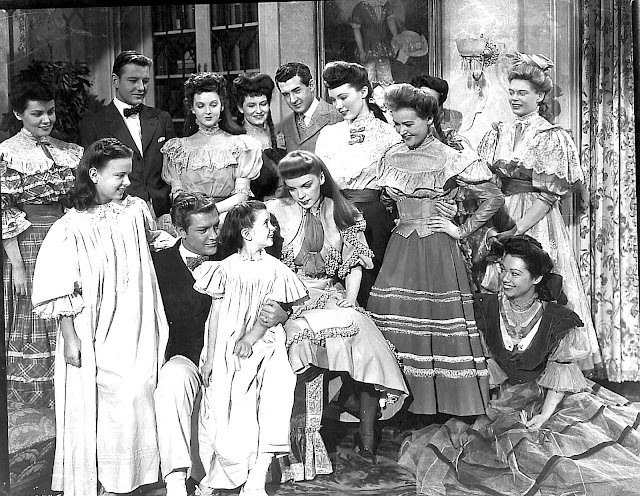 Gilmore Raye is to the immediate LEFT of Tuttle Nitch in that HARVEY GIRLS still. The dish is definitely spelled 'rarebit'. I'm from the northwest of England, quite near the border with Wales, and my father has made Welsh Rarebit for many, many years. It is NOT just cheese on toast, though...it also includes egg whipped into the cheese. ...And let's not forget about Winsor McCay's DREAM OF A RAREBIT FIEND comic strip from long-long-long ago. It had some pretty psychedelic imagery. The Welsh comestible must have bewitching effects on its consumers...I think I'll try it. My bete noire was, almost literally, the clarinet. Upon my entry into the fifth grade, my afternoons would be spent in practice, a puddle of spit gradually accumulating under the bell of the instrument. This culminated finally in a Christmas concert at which something vaguely suggestive of "White Christmas" was performed. Afterwards, the futility of the experiment was generally acknowledged and no more came of it. Now I tell people that I love music much too much to inflict myself on it. As for your enthusiasm for the bit player in the party scene, perhaps you've a little of the Mr. Bernstein character in Citizen Kane, remembering the young woman in the white dress he saw on a ferry boat. It is the same for me. 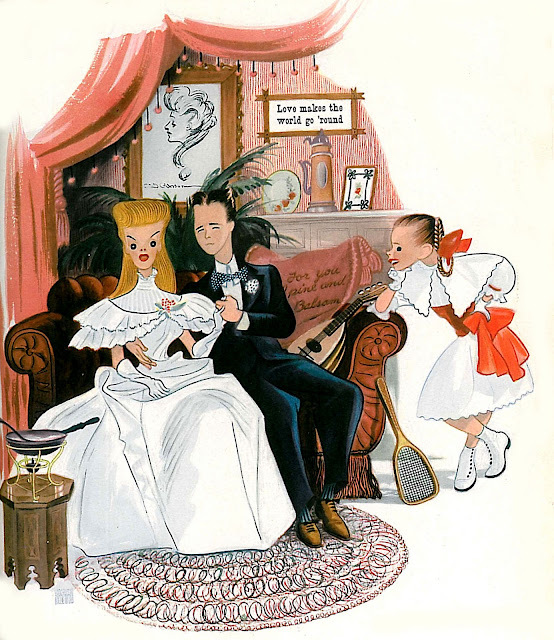 There is always a girl in a white dress, seen once or even twice, and not forgotten. For those I came to know, it is only more so, but also the sense of loss at parting. By the way, Part Two of MMISL goes up tomorrow (Monday) morning. I've said it before and I'll say it again now: With all due respect to Gone With the Wind, Citizen Kane, The Wizard of Oz, or anything else you care to name, Meet Me in St. Louis is simply as good a movie as Hollywood ever turned out. Period. Another fun one! I KNOW I have to have copied you a million times with my worn-out "trek around Lot 2 at old M.G.M" story dating from the infamous auction there ca. 1970, so I'll spare you a repeat! Finally one of your readers beat me to the punch in mentioning the wonderful silent trick film, "Dream of a Rarebit Fiend". I wasn't aware it was another creation of the amazing Winsor McKay. I thought it was a creation of the pioneering director Edwin Porter. I saw it screened once at Forry Ackerman's house, and the degree of realism and cleverness in the realization of the imagery was really breathtaking, something any true film fan would be equally 'wowed' by. The dish itself does not sound very appealing to me, but I'm sure it helps authenticate the feeling of period in this picturebook movie. I was going to order this anyhow, because it's my dear daughter's favorite Christmas movie. But, your timely column was an additional spur to action! Would get a kick out of your reading of some kind of sexual perversity (!) in this movie. I think it managed to elude me...but with you pointing it out, I'm almost fearful I'll 'get' it, too! Maybe I shouldn't read that insightful opinion! Fearful is right, Craig. Maybe it was better that I kept my twisted reading of (certain aspects of) MMISL to myself. We have a marvelous restaurant/pub out here on Sunset, in Hollywood, called "Cat and the Fiddle" and one of their specialties is Welsh Rarebit. They do it very well, and have had it there many times. This is basically a "British" traditional dish, which might explain why you'd never heard of it, let alone tried it. Traditionally, it is served with bacon slices and sliced tomatoes, and served on toast points or English muffins, and I recommend it, if melted cheese is your thing. Years ago, I was cast in a comedy role in the most gawdawful pilot I think that ever was done. As memory serves it was called "Patrick's Place" and it was one of those experiences most actors would prefer to forget. Anyway, the "host/singer" of this opus was also the producer and his (business) partner, so I was led to understand, was Tom Drake. One day during shooting he asked me if I knew who Mr. Drake was and he i.d. him by saying he had been "The boy next door". Yes, of course, I answered. I never saw Mr. Drake at anytime while we were shooting, but I understand that his later years were very unhappy ones and as you say he lived on those memories. I could never understand why Metro kept him contract, he seemed to have no talent nor charisma whatever. Best for the holidays to you and yours, John and thanks for these "swell" posts which never fail to entertain and enlighten! My mother adored Tom Drake, and sent off to MGM for a signed photo, which she has to this day. The two Dorothy's appear as themselves (circa 1992) in the TV doc "MGM: When the Lion Roars" I believe they are shown together commenting on Garland & Minnelli and life at MGM back in those days. Thank you ever so much for this wonderful article,it absolutely made my evening to read this and the comments in reply to it. This is one of my top favorite movies, to me it most definitely is a Christmas movie, the warm feeling that it gives you is always a joyous experience. Thank you again!!! And thank you, Pat, for going back into Greenbriar archives to check out this post from 2011. It's always good to know that oldies are still being noticed by readers.